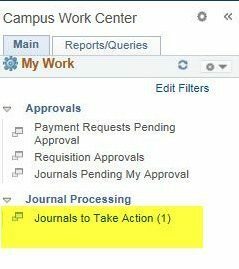 For the person that KEYED THE JOURNAL, there will be an item in the “Journals to Take Action” link, to act as a reminder, or to click on the hyperlink to take action. It is possible to take actions from this screen, e.g. Submit for Approval, Check the Approval Tab, Edit again. If needed, please copy the journals into the next month by using a date from the next month. Instructions to Copy Journal: Page 14 . BE SURE TO REATTACH DOCUMENTS TO ** NEW** JOURNAL. Be sure to edit and “Submit” the new journal for approval. Journals will automatically be deleted by the 15th of the Month, so if you need to copy them, please do so before this date.